“Isang Araw” (One Day), the sequel to the Isang Araw Lang The Movie shown in 2009, kicked off its gala premiere screenings at Melbourne Convention Center in Australia (January 26), Dulsco Sports Center in Dubai,UAE (February 14), and Concorde Hotel in Singapore (February 16). Movie supporters from Sydney, Perth, Brisbane, Adelaide and New Zealand travelled all the way to Melbourne, Australia to watch this soulful movie. Many were touched of the movie’s stunning and superb storyline written and directed by the award-winning veteran broadcaster Mr. Public Service “Kuya” Daniel Razon. Isang Araw is cast with gigantic names in Philippine cinema including Rey PJ Avellana, Jackie Lou Blanco, Jess Lapid Jr., Toby Alejar, Daria Ramirez, Bayani Agbayani, Ricardo Cepeda, Eagle Riggs, Lou Veloso, and Ritz Azul. Also seen in the movie are comedians Dennis Padilla, Dinky Doo, and Long Mejia, actors Brandon and Kier Legaspi, and Djani Packing. UNTV personalities such as Jeffrey Santos, Rep. Erin Tañada, Atty. Regie Tongol, Louella De Cordova, and Kuya Daniel‘s wife Ms Arlene Razon also played meaningful roles in the movie. In this film, people could learn myriad virtues like doing simple act of kindness without expecting anything in return. 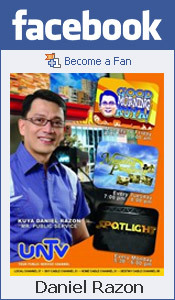 Proceeds will help fund the various public services carried out by Kuya Daniel through UNTV. The Isang Araw Movie Theme Song was composed and sung by veteran singer-composer Mr. Mon Del Rosario. In the Philippines, the two special screenings of the film were successfully held at Sofitel last year on November 28 and at the Philippine International Convention Center (PICC) last December 16. Isang Araw’s next stop for its global screening is set in Hong Kong this March 2014.